Pakistan can be a heaven for foreign visitors. Unfortunately, in the last few years, the country’s tourism has suffered a great set back due to the repetitive terrorist activities. The recent status of being the world’s top adventure travel destination by the British Backpacker Society is enough to support the notion. The current regime wants Pakistan to flourish and so wants more and more people to visit the country every year. This will also help the international trade to develop in the country and will bring home some great investors too. Considering this the government of Pakistan has eased the visa policy. Under this new visa policy, people coming from different countries will now enjoy the benefits they were not enjoying before. 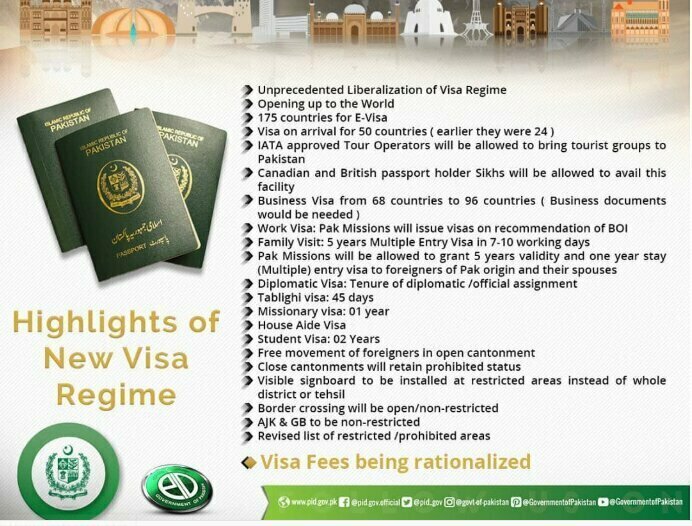 The only countries still kept away from this new visa policy list are India and Israel.A s per the statement issued by the Federal Information Minister Fawad Chaudhry Friday 25th January 2019, the facility of getting the E-Visa will now be extended to 175 countries. This along with other important announcements was made after the cabinet session that also included the chief of army staff and the State Minister for Interior. The minister stated further that this step is being taken to encourage tourism and open new doors to the people living in other parts of the globe. An extendable business visa will be given to the people of 96 countries for a period ranging from one year to three years. The student visa can now be extended for over two years as well. The tourists will be able to visit the magical beauty of the Azad Kashmir and Gilgit Baltistan without any restrictions. Getting on entry visa is now possible too. The government hopes that there is a better future for Pakistan coming ahead. The times are changing and good times are coming for Pakistani tourism and finances.